The purpose of this article is to discuss openly the issue of the physical abuse of American Indian women in a manner that reflects the authors' knowledge of how American Indian people live. This article confronts presumptions or pre-existing notions about the indigenous people of the United States that pervade popular culture. Initially, this article will examine the sovereign nature of the tribal nations within the parameters of both international law and United States jurisprudence. This article will also address the way in which some international instruments relate to the rights and protection of indigenous people, including specific provisions for protecting women. Furthermore, this article will provide an overview of the American Indians' shared world view, revealing values in sharp contrast to those of the majority of American society. The lives of indigenous peoples are anchored upon communal values, rather than individualism, as the primary guide to behavior. 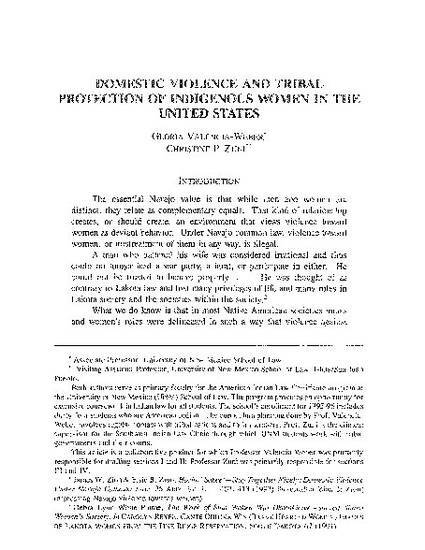 Finally, this article will demonstrate how some tribes seek to protect their female members through codes, customary law, and intervention programs which provide services to victims, abusers, and their families. Readings in American Indian Law, Recalling the Rhythm of Survival 264 (Jo Carillo, ed., 1997).